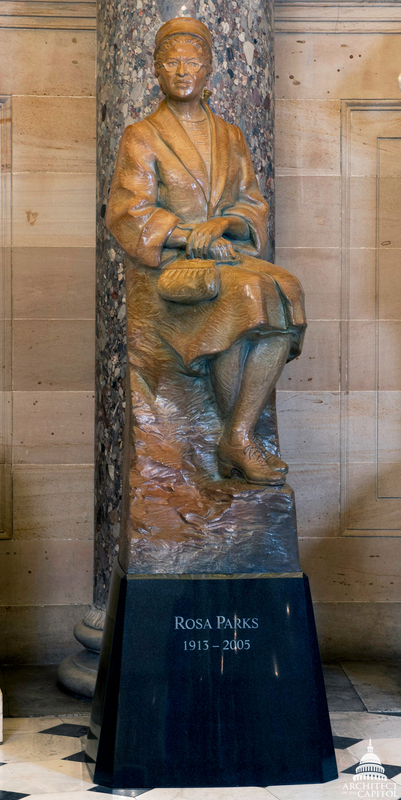 Rosa Parks' statue was unveiled in National Statuary Hall of the United States Capitol, approximately 100 years after her birth on February 4, 1913. This statue depicts Parks seated on a rock-like formation of which she seems almost a part, symbolizing her famous refusal to give up her bus seat in 1955. Rosa Louise McCauley was born in Tuskegee, Alabama, on February 4, 1913. She was raised on a farm, attended rural schools, then took some vocational and academic courses at the Industrial School for Girls in Montgomery before leaving to care for her grandmother and mother during their illnesses. In 1932, she married barber Raymond Parks, who was working with the National Association for the Advancement of Colored People (NAACP). In 1933, she completed her high school studies. Ten years later, she joined the NAACP and was elected secretary. Her involvement with the organization heightened her awareness of the injustices imposed by Jim Crow laws in the former Confederate states, which mandated racial segregation in public facilities and retail establishments. On December 1, 1955, while riding a bus home from her job as a department-store seamstress, she refused to obey the driver's direction to move from her seat to make room for a newly boarded white passenger. She was arrested. On December 5, at her trial, she was found guilty of disorderly conduct and violating a local ordinance. That day was also the start of a bus boycott that would last more than a year and increase the prominence of many figures in the civil rights movement, including Dr. Martin Luther King, Jr. The boycott ended only after a separate Supreme Court decision held that segregation on public buses was unconstitutional. After her conviction, Parks was fired from her job and she and her husband sought work, first in Virginia and then in Michigan. She worked as a seamstress until 1965, then served as secretary and receptionist to U.S. Representative John Conyers until her retirement in 1988. She co-founded the Rosa L. Parks Scholarship Foundation in 1980 and the Rosa and Raymond Parks Institute for Self-Development in 1987. She published her autobiography in 1992 and her memoirs in 1995. Rosa Parks remained an icon of the civil rights movement to the end of her life. In 1999, the United States Congress honored her with a Congressional Gold Medal. 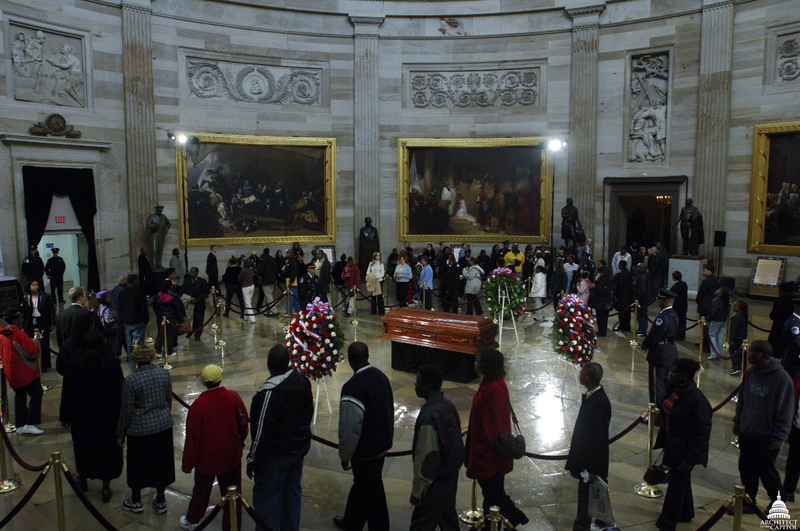 Following her death on October 24, 2005, she was accorded the rare tribute of having her remains lie in honor in the Rotunda of the U.S. Capitol in recognition of her contribution to advancing civil and human rights. 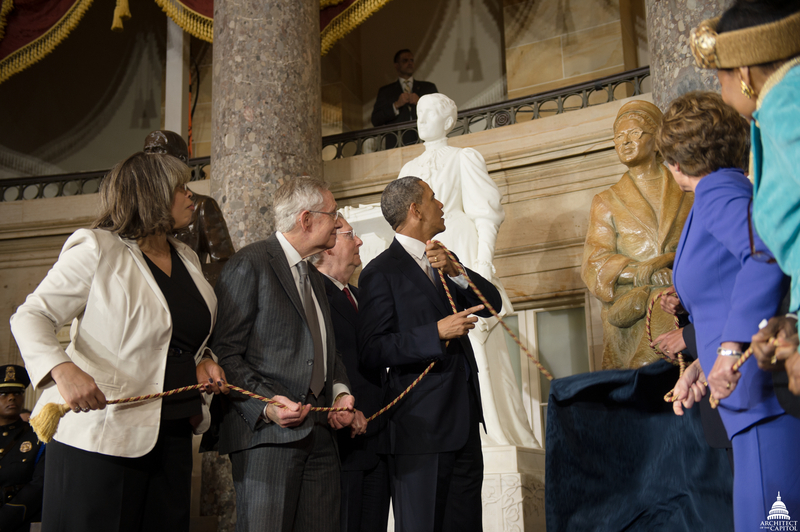 The statue of Rosa Parks authorized by the Congress in 2005 is historically significant as being the first full-length statue of an African American person in the U.S. Capitol. It is also the first statue commissioned by the Congress since 1873. It follows the bust of Martin Luther King, Jr., also commissioned by the Congress, that was unveiled in 1986 and the bust of Sojourner Truth placed in 2009. The statue depicts Rosa Parks wearing the same clothes she wore on the day she was arrested. Based on photographic research into what she was wearing the day on the bus, she is shown wearing a round brimless hat, glasses, a cloth coat over her dress, laced shoes and she holds the handle of her purse. She is seated on a rock-like formation of which she seems almost a part, symbolizing her famous refusal to give up her bus seat. Her upper body is slightly turned to the right. Her head is erect, her back is straight and both her hands and her ankles are crossed; this posture, along with the expression on her face, suggests inner strength, dignity, resolve and determination, all characteristic of her long-time commitment to working for civil rights. 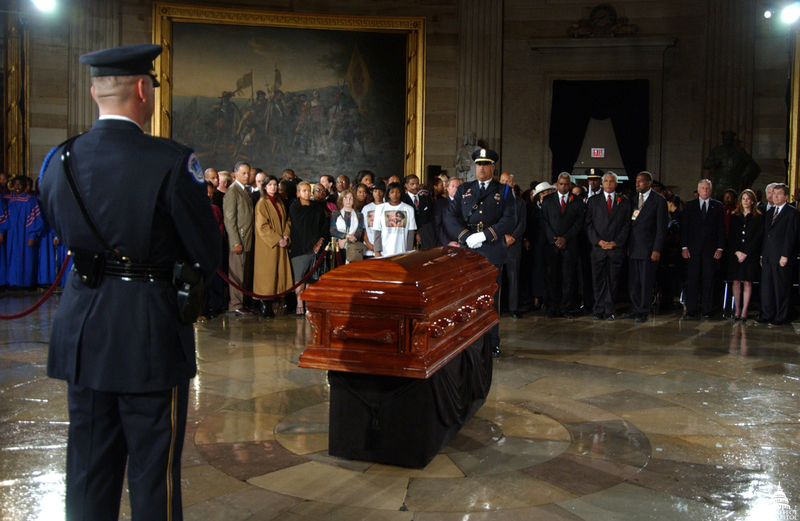 Unveiling ceremony in National Statuary Hall on February 27, 2013. The statue is close to nine feet tall including its pedestal. The bronze statue weighs 600 pounds and the granite pedestal, partially hollowed out inside, weighs 2,100 pounds. The pedestal is made of Raven Black granite and inscribed simply with her name and life dates, "Rosa Parks/1913–2005." A national competition was managed by the National Endowment for the Arts in partnership with the Architect of the Capitol to select the statue's design. Artists' proposals were reviewed by a panel of experts and judged on artistic excellence and artistic merit. Ten semifinalists were selected by the panel to produce a maquette, or small-scale model, of the proposed sculpture. Several entries were then selected by the panel for the review and final selection by the Joint Committee on the Library. The commission was awarded in November 2009, to Daub and Firmin Studios, LLC, which is based in Kensington, and San Pedro, California. Eugene E. Daub, a sculptor with more than 30 years of experience, was the master artist and sculptor. He studied at the University of Pittsburgh, the Pennsylvania Academy for the Fine Arts, and Alfred University in New York. He is a Fellow of the National Sculpture Society. Dr. Rob Firmin, partner at Daub and Firmin Studios, provided research for this project and worked with Daub on the concept and design of the statue. Dr. Firmin, earned degrees in history and art history, an MBA from Columbia University and a Ph.D. from the University of Chicago. Partnering with Eugene Daub since 2005, he has contributed to 40 public art sculptures in addition to his own work. Together they created a unique design for the statue of Rosa Parks that captures her dignity, determination and resolve.